Wella Professionals Invigo Color Brilliance Mask for fine to normal, colored hair is a light hair treatment with lime caviar and diamond dust, which leaves the hair in brilliant shine and intense luminosity. In addition, the hair color is protected from fading. The optimized low pH formula helps to close the cuticle after coloration, to enable a better colour retention. 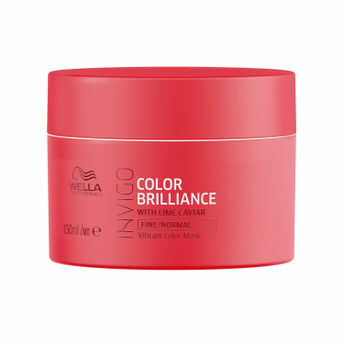 It is a powerful combination of ingredients such as copper, histidine, vitamin E and lime caviar to maintain colour vibrancy and protect coloured hair. Copper encapsulating molecules maintain vibrancy. Histidine and vitamin E help to control the oxidation process after coloration and to protect colour. Giving an excellent hair feel after colouration and protects color for upto 7 weeks.